Thank you very much to our Customers! We are pleased to inform you that your generous donations, which were collected by Toradex during Embedded World 2012 in support of the German and Swiss Red Cross, sum up to 21’000 Euros. 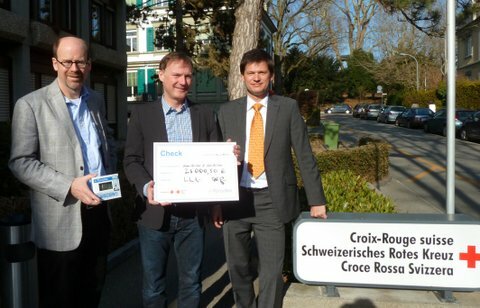 Toradex representatives handed over this money to the Swiss Red Cross in Bern on March 12th. Half of this sum will transferred by the Swiss Red Cross the German Red Cross. In total, Toradex placed ONE THOUSAND Colibri T20 Performance Kits with qualified engineers and talented students during Embedded World 2012. Don’t hesitate to contact our Email support on support@toradex.com or visit developer.toradex.com for detailed technical information and a whole range of downloads and useful support tools.